"Despite a domestic oil glut, the Trump Interior Dept is rushing through permits to allow destructive oil drilling in the Arctic refuge because the lobbyists and executives from the company that will most profit runs the Department. That's the Swamp." Well pondering, we shall let the future unfold. Woodfibre LNG just announced approval of its project by the Squamish nation, crude by rail is ramping up to considerably more volume, smaller producers are using truck/ rail combinations to access higher market prices in niche markets. Enbridge Line 3, KXL and Trans Mountain will all go ahead. You cant stop progress and you do not have the will of the majority to even try. Even oil people know oil's future is limited which is why they are all trying to sell theirs as fast as possible. KXL may go through. As I have said before that is between Alberta and the US. So far, US courts are saying no. We can't win every battle so seems like the LNG thing is going forward. It is not as great a threat to the immediate environment so the opposition is not as strong. The courts have stopped TM and cited the acknowledged risks to the ocean. Even if the courts eventually approve it there will still be a "how far will you go" showdown between the government and protesters. As to the rail and trucks, you have a solution so use it and lay off with the histronics. The log jam is neither new nor unpredictable. Does Alberta's oil industry not plan in advance? The buying rail cars thing is just another bluff. Either that or it is sheer stupidity. If it were economically profitable the oil industry would have done it already. Even oil companies want limits on production. In my opinion Alberta is mismanaging its oil industry due to free market ideology. A shame the free market ideology does not extend to pipelines. If you can't sell something it doesn't get built. Alberta has been unable to sell its pipelines. In today's world progress is defined as moving away from fossil fuels. I am experiencing climate change. The predictions of more extreme weather are coming true. The economic costs are rising. Deaths from pollution as well as climate change are being registered. Concerns over plastic are ever rising. The truth is green technologies from geo-thermal to solar to wind and even hydro are more than cost effective if you take into account the economic cost of the damage to human and planetary health. I'm sure it was cheaper to toss garbage out the window than to collect it yet still we started collecting it because the cost to human health and the discomfort of living in it was greater. People are placing a high value on protecting themselves and their children from pollutants. Sustainable living isn't a fad. It is the wave of the present as well as the future and you can't stop progress. Alberta is embarassing itself with the victim posturing. If Alberta does poorly enough it can become a have-not province and recieve funds from the federal government. That should alliviate some of the bitterness from the suffering Alberta is experiencing. Oh my, the arrogance in your post is exceeded only by your ignorance of the oil economy and its importance to Canada as a whole. One has to wonder about the good nature of Albertans when in the face of this second attempt to transfer western wealth to the east, Albertans are still not considering their options about leaving Canada. So far. Oh my, the arrogance in your post is exceeded only by your ignorance of the oil economy and its importance to Canada as a whole. One has to wonder about the good nature of Albertans when in the face of this second attempt to transfer western wealth to the east, Albertans are still not considering their options about leaving Canada. So far. If anyone here is arrogant it is you. Rejecting a pipeline is not a transfer of wealth. I absolutely respect the right of Alberta to separate if it so chooses. I would regret it but I won't sacrifice my own province. If Alberta gets XL you won't find many Canadians opposing it. We are not trying to hurt Alberta we are trying to protect ourselves. The Trans Mountain oil pipeline is costing a Canadian Crown corporation some staggering interest expenses that cast doubt on strong revenues from the infrastructure touted in the federal government's recent economic update. The interest expenses were $20 million over a single month in September, right after Prime Minister Justin Trudeau's government purchased the pipeline and related assets from Texas energy company Kinder Morgan for $4.5 billion. As part of the purchase, the government also had to set aside an additional $500 million as a security deposit in case of environmental damage, and this appears to be part of the interest expenses. If the interest expenses continue to pile up at that rate over the year, they will come to represent a larger sum than the amount of money that the government has said the pipeline is on track to raise this year primarily from toll charges. In light of the new figures from CDEV, Morneau’s fiscal update is misleading, argued economist Robyn Allan, a former chief executive officer of the Insurance Corporation of British Columbia. Tom Sanzillo, director of finance at the Institute for Energy Economics and Financial Analysis, co-authored a report in June with Kathy Hipple, a financial analyst at the institute and corporate finance lecturer at Bard College, stating that the Canadian government was facing at least $11.6 billion in costs to complete the pipeline. “This transaction and the cost of further planning and construction could add a $6.5 billion unplanned expenditure to Canada’s budget during FY 2019,” the report states, boosting Canada’s projected deficit by 36 per cent. Sanzillo told National Observer that while it is not uncommon for a government economic development transaction to keep revenues, capital costs and operational expenses separate, the interest expenses and fiscal update numbers represent an incomplete picture. “For a project of this size and importance,” said Sanzillo, “the executive has a responsibility to also produce an all-in-one, true and accurate inclusive project accounting that answers the question: 'How much is this costing the Canadian taxpayer?' These financial disclosures are partial, and absent a full accounting, are irrelevant. Because it is only a partial explanation, it says nothing about the financial viability of the project." National Observer asked Morneau’s office why Trans Mountain appeared to be on track to incur more interest expenses than earnings, whether the minister knew about the interest expenses reported by CDEV at the time the fall fiscal update was presented, and if so, whether he deliberately withheld that information from the public. ..trudeau doesn't answer the question. The fight to save the critically endangered orcas of the Salish Sea is the latest in a sequence of campaigns led by Northwest Tribes to protect natural and cultural heritage from fossil fuel and industrial threats, with great benefits resonating far beyond Native communities. These struggles have brought tribes together with unusual allies, including fishers, farmers, ranchers, faith-based communities, and most recently, natural history museums. The Salish Sea–one of the world’s largest and biologically rich seas spanning the waters of northwest Washington and southwest British Columbia–is in the crosshairs of the fossil fuel industry, which wants to get coal, oil and gas from the interior of North America to markets in Asia as cheaply as possible. At least 20 proposed fossil fuel infrastructure projects have been soundly defeated by coalitions led by the region’s Native Nations in recent years. Tribal sovereignty and treaty rights have played a central role in these victories, as have traditional art and storytelling. Since 2002, the House of Tears Carvers of the Lummi Nation in northwest Washington has transported hand-carved totem poles thousands of miles across North America to raise awareness, build alliances, and unite communities around issues of concern. For the last 6 years the annual “totem pole journeys” have dealt with the threats posed to water and wildlife from fossil fuels. The latest totem, carved into the shape of a killer whale (or orca), will enter a museum for the first time this December when a new touring exhibition and corresponding multi-channel film debuts at the Florida Museum of Natural History. Created by Lummi Nation and The Natural History Museum (a pop-up museum that highlights the “socio-political forces that shape nature”), Whale People: Protectors of the Sea narrates the plight of the orcas from an Indigenous perspective. EDMONTON – In response to an industry-wide glut caused by an inability to get its oil to Pacific tankers, the Notley government has decreed that every Albertan travelling to the West Coast will be required to take at least one barrel of Western Canadian Select with them. Airports and airlines have stated that Albertans will be allowed to carry the required 158 litres of oil with them when they fly, but checked oil barrels will be subject to the standard luggage fees and for safety purposes carry-on bitumen must be portioned out into individual 100ml bottles. “Given us so much metaphorically speaking. Our royalty rate will remain competitively, or as some call it, criminally, low,” she added. Other provinces have been inspired by Alberta’s new law, with Quebec turning its vacationers into international maple syrup smugglers and Newfoundland requiring all citizens returning from trips to Europe to bring back one live cod. Khelsilem, co-speaker of the Squamish Nation, Kukpi7 Judy Wilson of the Neskonlith, Grand Chief Serge "Otsi" Simon, Mohawk Council of Kanesatake, Chief Lee Spahan, Coldwater, Denise Cole, Labrador Land Protectors, and Andrea Batien, Indigenous Climate Action. Thousands gathered at Place du Canada in downtown Montreal on Saturday to sound the alarm on climate change. The event was scheduled to take place during COP24, the United Nations Climate Change Conference being held in Poland from Dec. 2 to Dec. 14, with similar marches being held around the world. In Montreal, the rally attracted concerned citizens and Indigenous leaders from British Columbia and Quebec who are opposed to the Trans Mountain expansion pipeline. 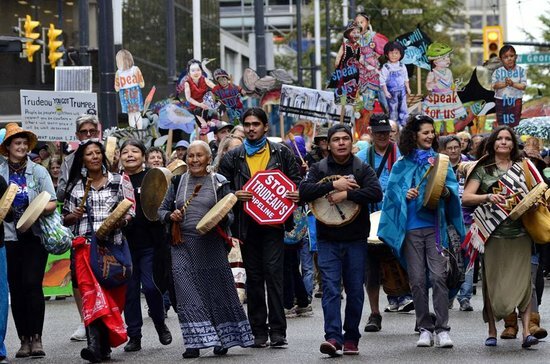 “We are fighting for our lives against an oil pipeline project that would expand and go into our territory and be shipped off overseas,” said Khelsilem, a Squamish Nation councillor and spokesperson. For Khelsilem, Saturday’s march was about building bridges and a better future. “Participating today is really about building those linkages in our country with all the people, all Canadians, all people of the world who care about the future of our climate and standing together to make sure that we fight for the future that we want,” the councillor said. Pointing to similar goals, Nathalie Roy, spokesperson for The Planet Goes to Parliament, said the citizen-led group was marching in solidarity with Indigenous leaders. “One of our fundamental demands is that any new oil and gas plans be halted, that fossil fuels be left in the ground,” she said. "Three Indigenous Land Defenders with the Tiny House Warriors were arrested today during a highly controversial meeting called by federally-appointed official Frank Iacobucci...The Land Defenders arrested were Mayuk Manuel, Snutetkwe Manuel and Isha Jules. Mayuk Manuel and Snutetkwe Manuel are daughters of the late Arthur Manuel, a renowned Secwepemc Indigenous leader on the world stage and a strong advocate for self determination. The Tiny House Warriors are opposed to closed-door meetings by federal bands that turn away proper and rightful title holders. In the Secwepemc Nation, consent is exercised collectively. Federally recognized bands are part of the system enforced by the ongoing colonial administration and they do not hold title over the majority of our lands, which are unceded and not governed by treaties. We oppose the use of private security firms and the RCMP along with aggressive techniques such as those used during the arrest..."
"Words from my twin sister speaking on the #TMX pipeline and their fed appointed retired SCC justice [Iacobucci] hired to push through a fraudulent 'Phase III consultation' for TMX Pipeline. 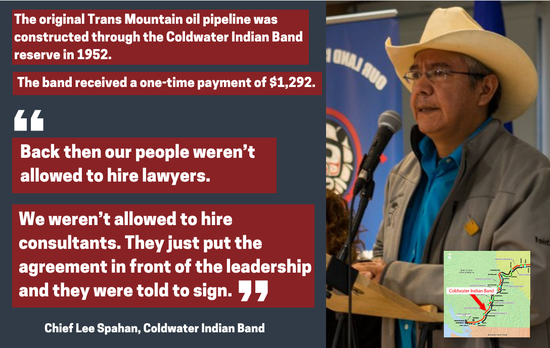 The feds also gave these same so-called 'Indigenous groups' $65 million as bribe money to sign deals with the pipeline company which is their own self - dirty government of Canada. We don't give our consent." "...The lead federal negotiator of the [T&R] settlement contract was Frank Iacobucci of the Torys Law Firm that specializes in serving blue chip corporate clients whose business interest is diametrically opposed to the truth concerning the genocidally unconstitutional invasion of the Indian territories for commercial purposes. Iacobucci was appointed Deputy Minister of Justice and Deputy AG of Canada. In September 1988 he was appointed Chief Justice of the Federal Court of Canada. He was appointed a judge of the Supreme Court of Canada on January 7, 1991. He joined the Torys Firm in 2004 after he had retired from the Supreme Court. In all those capacities he committed and is committing genocide willfully by blindsiding and suppressing constitutional and international law..."
Justin Trudeau's 'Meaningful Consultation with First Nations' via Frank Iacobucci. Who better? "Royal Bank, as administrative agent and a 24-bank lending syndicate in the C $5.5 billion in senior secured credit facilities provided to Kinder Morgan Ltd in connection with the expansion of the Trans Mountain Pipeline system." Prime Minister Justin Trudeau's new round of consultations with First Nation communities over the Trans Mountain pipeline expansion project got off to a rocky start Monday. Outside the hearing in Kamloops organized by Natural Resources Canada (NRC), three members of Tiny House Warriors - an Indigneous anti-pipeline group - were arrested after a noisy demonstration. APTN News has confirmed Justice Frank Iacobucci chaired the meeting at Thompson Rivers University..."
For more on Iacobucci see upthread from #114 down. "Overlooked are the problems with bitumen itself..."
"Natural Resources Minister Amarjeet Sohil and International Trade Diversification Minister Jim Carr will be at an Edmonton college campus to unveil a support package for oil and gas companies, which are reeling from record low prices. It is a package based in some ways on those offered to softwood, steel and aluminum producers after the United States dealt them direct blows with import tariffs. Canada's oil patch isn't facing that kind of pressure, but it is still the US behind much of its pain..."
As Chief of Saik’uz First Nation, I have spent many years working to defend our territory and future generations from the risks posed by oil pipelines. That’s why I was so dismayed to see recent media coverage of the proposed Eagle Spirit oil project, suggesting broad First Nations support for the proposal. The Eagle Spirit initiative is a business seeking to make money. It does not speak for our communities, and it certainly does not speak for Saik’uz First Nation. "We need to know our great grandchildren will look back, when they are elders, and feel grateful that we always made decisions with them in mind, decisions that support healthy lands, waters and the long-term well-being of our communities." Saik’uz First Nation spent a decade working with the Yinka Dene Alliance – an alliance of First Nations representing 25 per cent of the proposed route of the Enbridge Northern Gateway pipeline – to uphold the decision made according to our laws that oil pipelines would not be allowed in our territories. In this work, I and other Yinka Dene Alliance leaders have supported Coastal First Nations leaders in calling for federal oil tanker ban legislation. In 2016, I travelled to Ottawa to meet with federal ministers and urge them to pass a law banning oil tankers on the Pacific north coast – a law that would finally take this toxic issue off the table. A legislated oil tanker ban on the Pacific north coast is about more than protecting the ocean. It is also a recognition that the Yinka Dene Alliance and many other First Nations worked long and hard to ensure that our territories would be protected from unwanted oil pipelines like Enbridge’s Northern Gateway project. In this light, I was frankly outraged to see Eagle Spirit’s chief executive publicly claim that Indigenous leaders supporting the federal Oil Tanker Moratorium Act are “puppets and props” of foreign interests. This is profoundly disrespectful, and it sounds unfortunately identical to the dismissive language that the federal government directed at our communities when we opposed Enbridge. By midafternoon the snow had picked up — tiny, innocuous flecks becoming heavy, wet drops — but no one at Camp Anishinaabek seemed to notice. There were logs to split and shelters to insulate. A supply tent was still down after collapsing two weeks earlier during a storm. Line 5, operated by the Canadian multinational company Enbridge, has been enveloped in controversy for months. And even as calls for a shutdown have increased, Michigan’s outgoing governor has pressed for a new agreement to ensure it continues. "...the same chief who shared the stage with [Neil] Young as he blasted the oilsands as a 'disaster area from war', has signed an agreement in support of the most massive and expensive oilsands mine project ever proposed - to be built in his community's own backyard." "Tiny House Warriors village in Blue River Unceded Secwepemc Territory stopping TMX pipeline and man camps! Man Camps = Violence Against Women. There is no Secwepemc consent for this dirty bitumen pipeline to pass unceded Secwepemcul'ewcl. We will never Surrender or Compromise!" Trans Mountain is going ahead with its pipeline expansion project without permission and should be stopped, according to the City of Burnaby. But Trans Mountain maintains all work ongoing at the tank farm is related to permitted pipe relocation and decommission work – not the expansion project that was halted following a Federal Court of Appeal ruling in August, 2018. Mayor Mike Hurley told the NOW he wasn’t convinced Trans Mountain is playing by the rules. “It seems to be that they're preparing for the pipeline to move ahead as planned,” he said. McDade’s letter includes aerial photos supposedly showing work being done adjacent to the proposed sites of two new oil tanks – part of the expansion project. “These pictures show what appear to be welding tents and pipeline sections laid out on the ground,” McDade wrote. The photos also show the company clearing trees outside the scope of approved work, McDade said. The city followed up its Dec. 21 letter with a correction on Dec. 28. Blaming “holiday staffing,” McDade said the initial filing referenced orders for the Westridge Line – the pipe carrying diluted bitumen from the tank farm to the Westridge Marine Terminal – when it should have addressed orders for piping relocation and decommissioning. "Construction on the controversial Trans Mountain pipeline project is probably unlikely to begin anytime soon..."
The National Energy Board’s draft recommendations for its reconsideration of the $9.3-billion Trans Mountain oil pipeline expansion falls short of protecting killer whales and Canada’s climate goals, says the environmental group Stand.earth. Announced late last week, the National Energy Board would require the creation of a marine mammal protection program for the Trans Mountain pipeline in a series of draft conditions it has laid out before it considers the project. The focus of the review is to apply the Canadian Environmental Assessment Act and the Species at Risk Act to project-related marine shipping, the board says in the document. The conditions mitigate potential risks to the environment and protect the public, it says. “The board’s bias toward the oil industry is on full display with its proposed new restrictions on whale watching and ferries, while at same time continuing to allow a massive sevenfold increase in oil tanker traffic in critical orca habitat in the Salish Sea,” said Steven Biggs, a climate and energy campaigner for Stand.earth. The pipeline expansion would twin the existing 1,150-kilometre pipeline, built in 1953, and nearly triple capacity. Tanker traffic from the Burnaby terminal on the Burrard Inlet is estimated to increase from 60 tankers a year to more than 400. Biggs said the NEB recommendations are also almost silent on climate change. “It is outrageous that our country can perform an environmental assessment on a project that has the carbon footprint of 23 coal-fired power plants — without completing a full assessment of the climate impacts,” said Biggs. "Dozens of First Nations leaders are meeting this week to discuss a plan that could make them the next owners of the controversial Trans Mountain pipeline..."
Canada solves its pipeline perception problems and unloads a failed white elephant too. When the National Energy Board announced conditional approval for the Trans Mountain pipeline project in 2016, BC NDP leader John Horgan sent party members an important letter. Horgan, then opposition leader, said Kinder Morgan’s proposed pipeline expansion and the resulting “seven-fold increase in tanker traffic” would put the interests of British Columbians, salmon and the coastal economy at risk. But then he made this promise. Two years later, another flawed hearing run by the same discredited National Energy Board is taking place on the same uneconomic pipeline expansion. Yet Horgan seems to be in full retreat. The politician who once promised to use “every tool in the toolbox” to protect B.C.’s coastal economy and environment now appears mostly tool-less and toothless. As premier, Horgan has championed a liquefied fracked gas export industry by showering its earthquake-making developers with tax breaks and royalty credits. "Don't be [a] fool to Canada's messed up plan of pawning their failing pipeline on you desperate hungry sellouts." ..this project is not even close to being serious. "For us, it doesn't change anything, who owns it," said Khelsilem, a Squamish Nation councillor. "Whether it be a Texas-based oil company, whether it be the federal government or whether it be the Indian Resource Council, the issues on the ground remain," he told The Current's Anna Maria Tremonti. "Firefighters scramble to fire burning near KinderMorgan storage facility on Burnaby Mountain." A pair of experts on global warming have thrown their support behind a new legal motion urging the National Energy Board to consider all climate-related impacts from the proposed Trans Mountain oil pipeline and tanker expansion in its latest review of the project. The motion was filed on Monday by environmental group Stand.earth. The two experts have contributed to major international scientific assessment reports about climate change. Both of them warned that Canada needs to do its part by stopping the growth of emissions from the country's oilsands deposits of northern Alberta. Oilsands companies would be able to expand well beyond current production levels if the project to ship more oil gets the green light. The oilsands, bituminous heavy oil mixed with sand beneath the boreal forest, contain the world's third largest reserves of crude oil after Saudi Arabia and Venezuela, but they are also Canada's fastest growing source of greenhouse gas emissions. "If we build new fossil fuel infrastructure now, which will lock us into carbon emissions for decades, it will make it very difficult, if not impossible, to keep warming below 1.5 degrees," said Kirsten Zickfeld, a Simon Fraser University associate professor of climate science, at a news conference in Vancouver. A legal motion filed today, Monday, January 21, with the National Energy Board (NEB) on the Trans Mountain Pipeline reconsideration process, calls on the Board to expand its scope of review to include all upstream and downstream climate impacts for the project. The deadline for intervenors to file final arguments is January 22, and the pipeline company, which is now owned by the Canadian federal government, must reply to the arguments by January 25. The NEB’s final report will be submitted to the federal government on February 22. “Today we are filing a motion with the NEB asking them to simply apply the same standard to Trans Mountain that they applied to Energy East when it comes to the pressing issue of climate change. Anything short of that would be an abdication of the federal government's responsibility. There is not another form for these concerns about climate change to be heard — this is the last chance to do the right thing.” — Casey Leggett of Martin + Associates who is acting as legal counsel for Stand.earth in the NEB process. NEB Decision Day of Action: No Trudeau Pipeline Expansion! ..it just keeps getting worse and worse. Trans Mountain is on track to deliver Canadian oil producers a $2-billion taxpayer-funded toll subsidy for capacity on its existing pipeline and has asked the federal pipeline regulator, the National Energy Board (NEB) for permission. If the NEB approves the toll application Trans Mountain has filed with it, it will shift the burden for the roughly $3 billion Ottawa paid to buy the regulated assets onto Canadians, rather than into tolls charged to shippers where the recovery of these costs belongs. "Canada Action, a non-partisan, pro-oil and gas activist group in partnership with ROABA to organize the rally." Orcas, Sea lions and seals: dispelling the disinformation on J Pod. It doesn't matter what the numbers were in 1960. What were they in 1920? How about 1860? Longterm the numbers are too low. Tanker accidents threaten the environment, not just whales. How do you determine that " numbers are too low". Does your argument hold true for 'climate change as well or is it only trotted out selectively? According to the Pacific Salmon Foundation and UBC, orca population numbers are stable while you speculate but attempt to state as fact that numbers are not stable. Proof, please, not disinformation. And spare the tanker rhetoric, just facts on orca populations, please. I didn't say the numbers are not stable I said they aren't high enough. In my opinion 75 of anything is too low. Nor are we discussing stopping existing tanker traffic. The issue is radically increasing tanker traffic. Ah! No need for scientific data then. Tankers bother whales but freighters, ferries, tugs and huge cruise ships don't. Thanks for your opinion but I prefer facts. I do hope that more ocean research is done on the interface between human activities and wildlife behaviour and a comprehensive science-based policy results. I didn't say they didn't bother whales. I am sure that at least some of them do harm marine wild life. I believe there have been laws enacted concerning how close they can get to whales but I am not certain on that. If there is a movement to also prevent that traffic or to stop existing tanker traffic I would hear them out. Right now what I do know is that the trans mountain expansion is motivated by a desire to sell oil to China which would require a 7-fold increase in tanker traffic. I have read about enough oil "accidents" to have zero trust in the oil industry's ability to move large amounts of oil from one place to another. Saving money has always taken precedence over safety. Keystone just had another spill. The issue is trust. Nothing a scientist paid by the oil industry claims can be trusted. That is the fault of the oil industry. On another topic some Alberta producers are now saying the price of oil is too high. It has to be cheap to justify shipping by rail. There is outrage over using OPEC style caps to control pricing. It's the same attitude that objects to supply management. Alberta is ideologically opposed to using the tools it had to control pricing. The international oil companies want prices low to maximize the quantity of bitumen exported. That is not a valid reason to impose pipelines on provinces that don't want them. Alberta has multiple solutions. It just doesn't want them because they don't adhere to free market ideology. Regular citizens have long been sent the message by elites that we don't understand enough to have an opinion. We don't know enough of the science or economics or geopolitical facts. This has always been true. People vote based on who convinces them they can best manage the country. We only hope for some integrity we don't actually expect it. That's why JWR resigning is so shocking. She is showing integrity where it is rare. 300 meters but high speed whale watching vessels routinely harass whales in the name of 'tourism'. TransMountain has shipped oil from Vancouver for ~ 65 years. How many spills have occurred? The reality is that the China trade is wishful thinking as almost all oil exported from Vancouver goes to California. Do you know why? Because there are no pipelines to California. Well, the outright proven lies of the activist industry do not encourage any faith in their nightmares. The simple answer is that oil companies that own the entire value chain from explorer to refiner to marketer make a lot of money buying cheap oil from competitors and selling it at top dollar to consumers. Canada has a Constitution Act. You don't get to ignore the bits you don't like. i expect it. Most Canadians expect it. The fact that Trudeau and his liberals do not have any does not mitigate integrity as a Canadian value.